Collect dollars in a way that makes sense. With the right partner, an all-in-one payments platform is more powerful than you’d expect. The PaymentSpring Gateway is the upgrade new and established businesses are turning to for better payment processing solutions—including mobile and POS terminals. 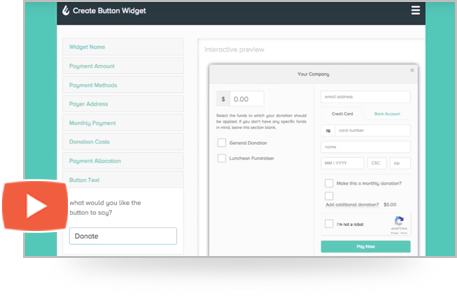 Our Checkout Widget lets you customize buttons or forms and “integrate” with a simple copy/paste. 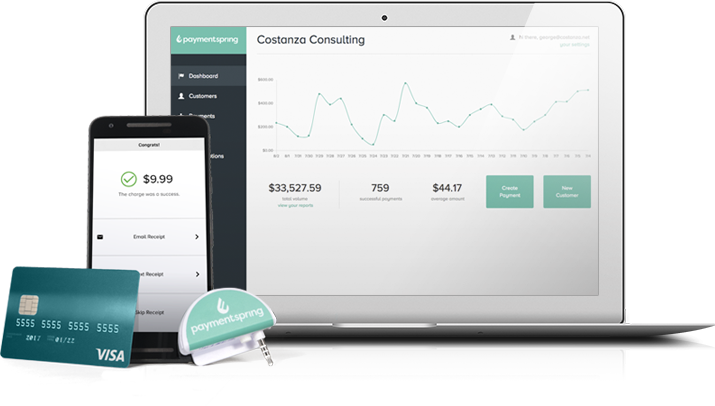 PaymentSpring helps merchants like you streamline payment processing. A single gateway that reports online and mobile payments together. Operate your business anywhere you want, anytime you want without the burden of online and mobile transaction consolidation. Know exactly where you’re at the moment you enter the dashboard. Plus, interact with customers wherever they may be with PaymentSpring’s free mobile app and mobile card reader. No third-party redirects or signing in to pay. Conversions increase when customers are offered a seamless and simple purchasing experience. The PaymentSpring Gateway provides just that with a simple and complete website integration. Secure vaulting and level 1 PCI compliance. Process payments to your heart’s content. Our developers provide end-to-end encryption, tokenization and a secure vault to house an unlimited number of ACH merchant accounts and credit card information for one-time and recurring payments. Time is money too, which is why sending electronic invoices directly to customers is good for business. Save the trees and allow your users to pay online with e-invoicing. Your customers and donors can easily set up a recurring payment plan or subscription billing with our recurring payments feature. Integrating is speedy and simple, and there’s no additional software fee. You might be thinking of our partnership or, perhaps, mobile and online efficiencies advancing your business. But this “two” is about you getting paid as quickly as possible. Which is why we turn most credit card payouts around in two business days. Rely on our support staff as an extension of your team. When you call, we answer. Responses are tailored to your needs—no generic, auto replies here. Our merchant services software will grow with your business. With easy API integrations and webhook monitoring functionality, Gateway can be whatever you need it to be.